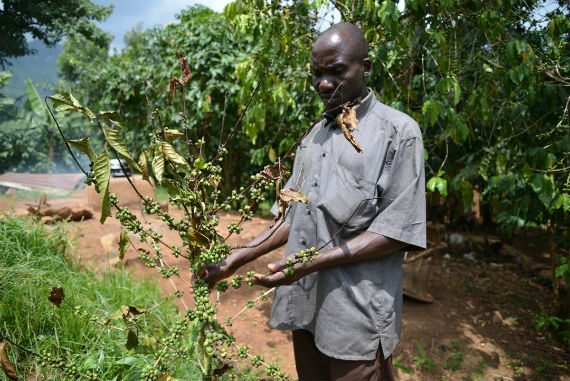 Crops sensitive to small fluctuations in temperature and humidity, such as coffee, pictured here in Uganda, are increasingly threatened by the effects of climate change. Coffee is an important supplemental cash crop for subsistence farmers in many parts of the world. Soon I will be making my way to the Paris Climate Conference where it is hoped that a new global climate change agreement will be concluded. The Paris Agreement has the potential to put our economies and societies on a path to green, risk-informed, and inclusive growth, and move us all towards a zero-carbon, sustainable future. The world must seize this opportunity. The main purpose of the climate conference, called COP21, is to agree on a comprehensive deal which places all countries on the same long-term development path. This bears repeating: Paris itself will not solve climate change. Instead, Paris will lay out the pathway towards that ultimate goal, the course we need to stay on in the years and decades to come. So what must this pathway contain? It must support green economic growth which is driven by innovation from forward-thinking sectors. It must support sustainable jobs. It needs institutions which encourage all levels of society--from civil society to public administrations and the private sector--to work together to tackle problems. It must contain the tools which enable us to adapt to our changing world. The old argument that addressing climate change will hurt jobs and economies is unconvincing. Green and inclusive growth is the way of the future. At the UN Development Programme (UNDP), we have worked with countries and communities across the globe to invest in new technologies, protect forests and biodiversity, and to help make economies greener and more climate friendly. We see large, macro-economic shifts in countries like Uruguay and South Africa which have kick-started entirely new renewable energy sectors, while smaller, off-grid innovations in countries like Nepal are enabling communities to benefit from sustainable energy access. Such experiences and lessons need to be scaled up widely. An ambitious deal in Paris can pave the way for countries to seize the economic opportunities of green growth. By encouraging increased investment in renewable energies and innovative approaches to adaptation, countries will create new 'green' jobs and stimulate innovation. Climate change is an all-of-society concern which requires an equally all-of-society approach, starting with whole-of-government action. As ambitious plans to tackle climate change move forward, partnerships are needed. Academia, NGOs and civil society groups, large enterprises and small independent businesses, indigenous peoples and local communities, all have a part to play in moving sustainability forward. Governments and multilateral agencies cannot address this challenge alone. At UNDP we continue to work with partners around the world on climate -related initiatives. In India, for example, the approach has resulted in small steel producing firms, many of them family-owned, lowering their carbon emissions; and from Sudan to the Sahel, local engagement has led to adaptation solutions being scaled up to manage drought and water shortages. When the ink dries on the outcome of COP21 in Paris and countries take climate action, there is much to learn from experience to date around the world. A new climate agreement in Paris and the pathway it maps out must acknowledge that many of the most vulnerable countries and communities will need support to adapt to climate change's impacts - and indeed to thrive in the face of considerable climate challenges. As we move into and then beyond Paris, and as we aim for a zero-carbon world, we cannot leave behind those who have already begun to suffer from climate change. This is especially important for Least Developed Countries and Small Island Developing States, amongst the most vulnerable the world, over which are less likely to benefit from large-scale private sector investments. It is imperative that Paris reach out to the last mile and ensure that such countries are supported to adapt and to mitigate. The Green Climate Fund has begun to make funding decisions in support of highly vulnerable nations. The new "V20" Finance Ministers grouping, gathered around the Climate Vulnerability Forum, is a co-ordination effort by those ministers from the most vulnerable nations of the world, and UNDP is supporting their work. Paris must be a catalyst for stepped up climate action. The world must move towards a zero-carbon future. There is no room for short-sightedness or a lack of ambition. When a new climate deal is reached in December, as we hope and expect, let us all roll up our sleeves and get to work to ensure that Paris is a decisive step forward on the journey to zero-carbon and sustainable development. This post is part of an "Earth To Paris" series produced by The Huffington Post and Earth To Paris, in conjunction with the U.N.'s 21st Conference of the Parties (COP21) in Paris (Nov. 30-Dec. 11), aka the climate-change conference. The series will put a spotlight on Earth To Paris, "an innovative campaign and convening strategy to drive awareness and host events that highlight the connection between people and planet and the need for strong climate action," and is part of HuffPost's What's Working editorial initiative. To view the entire series, visit here.